It is hard to believe that last week was the two year anniversary of Henry’s knee surgery. When Henry was about six months old and went in to be fixed, the vet discovered that he had hip dysplasia. While hip dysplasia can be debilatating for larger breeds the vet assured us that if we keep Henry at a trim weight that he would never need any type of hip replacement surgery. It was at that point that we became fanatical about watching what both the boys ate because we knew the heavier Henry was the less comfortable he would be and the less he would be able to exercise. The six months following Henry’s diagnosis were great. He was a happy puppy that loved to run around, go for walks and go to the dog park. Shortly after his first birthday, we went to Florida on a little vacation. While in Florida the boys had so much fun going on walks to new and exciting places, going to the beach and running around the pool. Henry was just as active as usual, but towards the end of the trip he kept holding his left hind leg up. We were very alarmed knowing that he had hip dysplasia. We called our regular vet from Florida and scheduled an appointment for the day after we returned from our trip. The vet examined Henry and quickly determined that he had luxating patella, which basically means that his knee cap was sliding in and out of place. 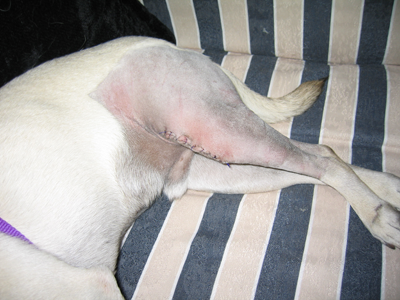 The luxating patella was likely caused by the extra pressure put on his knee from his hip dysplasia. The vet recommended that we take him to a specialist and we were able to get an appointment for the very next day. The specialist confirmed what our regular vet had diagnosed and recommended that Henry have surgery on his knee as soon as possible. We agreed to have the surgery and talked with the specialist on when the appointment would be. After looking over his calendar the specialist said that he had one spot open for surgery the next day and then after that he did not have a spot open for at least another month. We couldn’t imagine Henry suffering and limping around the house for another month, so we decided to schedule surgery for the very next day. The specialist was about 40 miles away from home and Henry needed to be back in his office by 7am the next day. It was already 3pm when we finished his appointment and the specialist said that we could leave Henry at his office to save us a trip in the morning. I thanked the specialist for his offer, but politely told him that my boy was going to be home with his family the night before his big surgery. On the car ride home, I think we were in shock. We had been home from our vacation for less than two days and our baby boy was going into surgery the very next day. It was all happening too quickly. Surgery day came and we dropped him off at the office with tears in our eyes. We went home to be with Benjamin who was extremely nervous (this was the first time, since he was a pup, that he was not with his brother). Later that evening the specialist finally called and let us know that everything went well with Henry’s surgery and that we could pick him up tomorrow afternoon after a short meeting to discuss his physical therapy requirements. When we picked up Henry that next day, nothing could prepare me for how he would look. The vet tech walked him into the room and his left leg and thigh was completely shaved. He was holding his leg up and the incision on his knee looked puffy and very sore. His eyes were watery and his nose was runny, I could tell right away that he was in a lot of pain. Despite his pain, he was very happy to see us and gave us a very warm greeting. The specialist came into the room and then showed us his physical therapy exercises which basically consisted of bending his knee. He hated these exercises and whined the whole time they were performed, but the specialist insisted that they must be done. When we arrived back home Benjamin was very happy to see his brother and very curious to find out what happened to his leg. We precisely followed the doctor’s orders to make sure Henry would have a complete recovery. It took about ten days for Henry to begin to put weight on his leg. Those ten days were very nerve wracking because the specialist said that many dogs learn how to get along on three legs so well that they never want to put weight on their sore leg again (that is why it was so important to do his physical therapy). After he started putting weight on his leg he was able to go up and down steps again and he was even anxious to go for small walks. Little by little he got back to being his normal self. Now, two years later, he is completely recovered and never favors his left hind leg. His surgery scar has faded, but is still pretty noticeable and while he sits a little funny due to his hip dysplasia he doesn’t let it slow him down. He is a healthy, happy little boy! Im so glad to hear that Henry’s knee surgery was such a success. I have a 3 yr old named Marshal who had the same surgery 4 weeks ago. Unfortunatly the outcome has not been so great. They had to break the tibia and reset it, this is not healing. He has been on volume to keep him calm because they don’t want him to use it. This also requires him to be confined to his kennel or my lap. Hes a very active little boy so this is very stressful. Our trip to the vet today was no better nothing has changed. We’re very concerned and not sure what to do. I am so sorry to hear about Marshal’s knee surgery. I hope the Dr’s can find a way to help Marshal recover comfortably. Be strong and know that we are thinking about you and Marshal. Hi, Our little 9 month old pug had the same operation. It has been 4 weeks and she is struggling to use it. The suggested that we bring her for xrays to see whether is was successful or not. We are approaching Bijou’s 1yr anniversary from her surgery. She luxated her patella jumping off the couch, when she saw someone walk buy are front window. It was the most upsetting thing as well as the most expensive thing we had dealt with, but we had pet insurance and she got the most excellent care. She healed great and now is as rambunctious as ever. We have that surgery in the future for Indy.. our Vet says at this point she doesn’t need it but I am very careful of where she walks (walking on gravel bothers her) and what she does. Plus we are getting her wait down so it bother her. I have just brought my 10mth cocker spaniel home after having the surgery to both knees, shes in so much pain i cryed.I know its for the best ,but i look at her and think why have i put her through so much pain, i hope she doesnt suffer to much while shes healing.